Drain clogs, causes and solutions. We make it a point to maintain all the areas of our house. We should also keep the sewage systems and drains of our house clean and well maintained. Let us take a look at the importance of keeping the drains clean and what are the reasons for your drains to get clogged. Drains and pipelines form one major part of your household. For every day work we need our pipes and drains clean. This avoids accumulation of water and keeps your house band its surroundings clean. Drains that work efficiently help in keeping your surroundings hygienic as well. Regular clean up prevents water borne diseases. Clogged drains can result in the whole sewage system to become affected. This means your bathrooms, toilets, kitchen sinks are clogged as well. You can only imagine how difficult it gets if all these areas stop working. When the drains get clogged, the first thing you should do is try to flush out as much as possible to see if the dirt goes away. Generally, the dirt that clogs the drain cannot be done by unprofessional. You need help from plumbers like us. You can call Corn Plumbing Services at (626)722-5002 to get your drain cleaned. It is very important to take care of the drains and pipeline systems. This not only means cleaning it up occasionally, but also getting it checked at least twice a year. Many times, we don’t notice that the drains have started to get ruined. We only notice when it gets serious and things start to smell or sound weird and that’s when it may be to late. Having said all of the above, drains getting clogged is a normal thing. It can get clogged if you flush unnecessary things down the toilet and washrooms. This includes sanitary napkins, wipes, plastic bags and so on. Drains can also get clogged if your area has hard water. Hard water contains minerals. Over years, these minerals get deposited on the body of the pipes. 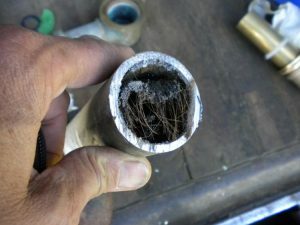 If they are not cleaned, the pipes get damaged and can result in water clogging. We can always prevent this with a bit of care. Make sure you don’t flush things down your toilet or kitchen sink. You can use filters for the sinks that trap bigger food particles. This helps in preventing the clogs. Get the sewage system checked from time to time. Teach your kids to keep the bathrooms and other sinks clean. A little bit of care can keep the drains clog free.